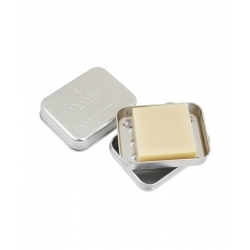 INCI: Sodium olivate (olive)*, Caprae lac (fresh swiss goat milk 25%)*, Sodium cocoate (coconut)*, Sodium shea butterate (shea butter)*, Sodium ricinoleate (castor)*, Sodium Cocoa Butterate (cacao)*, Parfum (100% natural**), Cera alba (beeswax)*, Rubia Tinctorum extract, Geraniol**, limonene**, linalool**. After the first use of this soap, my skin felt calm and nourished, The soap has a gentle aroma of geranium and does not dry the skin. I recommend this soap.